Since our year-end appeal to you last November, our senior residence on Gregory Boulevard has undergone important upgrades. Thanks to a major grant from the State of Connecticut, we've been able to spruce up the historic Marvin building with repointing of the brick exterior … and much, much more. New windows have replaced those installed more than twenty years ago, giving us a major boost in energy efficiency. Inside, residents now enjoy a higher level of safety, comfort and health with new AC and heating systems that include accessible controls in every apartment. Best of all, even with extensive improvements, our sliding scale fees are as affordable as ever. We continue to provide an award-winning "intergenerational model" — housing and supportive services for seniors on one side of the building, and a full-day preschool program with extended hours on the other. At Under One Roof™, and through The Marvin and the Marvin Children's Center, we meet the most vital needs of preschoolers, seniors and their families. We bring young and old together for mutually enriching experiences that dispel stereotypes and forge new connections. Generations learn to relate to each other through exercise, reading and bingo programs, gardening and holiday events and friendly visiting. Children learn skills needed for Kindergarten from their teachers, and skills for life from our senior residents. All of this requires planning by staff members who understand the in's and out's of successful intergenerational activities. To continue the creative and caring programs that have become the hallmark of our unique community, we once again turn to you. With twenty-plus years of unwavering attention to quality standards we've earned the reputation of Norwalk's "hidden gem." However, our State's fiscal crisis has resulted in cuts to subsidies and other ongoing funding. Your financial support will make it possible for us to sustain our current level of offerings. Our building now stands strong and comfortable in every season of the year. Won't you help make sure that our services and programs — the heart of our community, and yours — also remain robust and innovative? We urge you to take this opportunity to help ensure they do. Good people doing good work always deserve a helping hand. 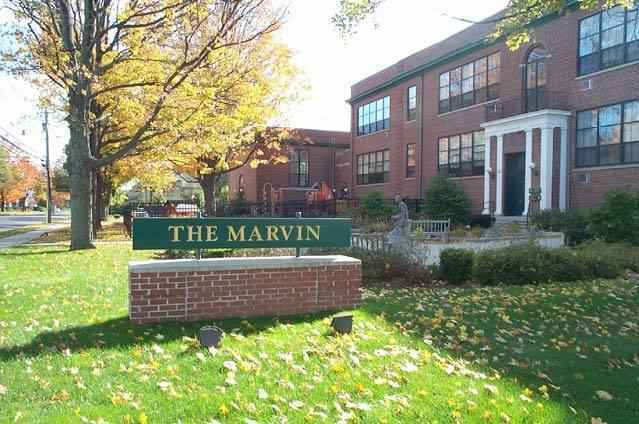 Congratulations to The Marvin for being selected as a recipient of The Mayor's Ball fundraiser!